I made another appearance on On Board Games to discuss how different games model supply and demand. 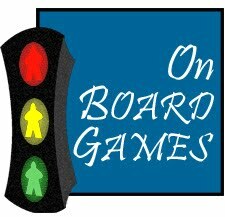 Have a listen at their site or at BoardGameGeek. You can also check out my previous appearance on the show where I discuss playtesting methods. --Good discussion. I liked the distinctions you made among various ways of approaching the market and whether there is a market or not. --I was amused by how many of the games mentioned were ones that either we introduced to you or that we learned when you did. --I guess Brass is a market game, then, although I had never thought of it that way. It's funny because the market only kicks in in case of an emergency (but emergencies are really common). I definitely have you two to thank for exposing me to many of my favorite games. It's definitely been a tough road, and I'm by no means there yet. I won't count my chickens until they're in a box with my name on it, shrink-wrapped on a shelf. However, I can't help myself with creating new stuff! I get ideas about how to model something and need to make a game of it.